What determines the life expectancy of a fabric structure, specifically the fabric itself? How does an owner select a building material when warranties often tout long time frames with no real substance? 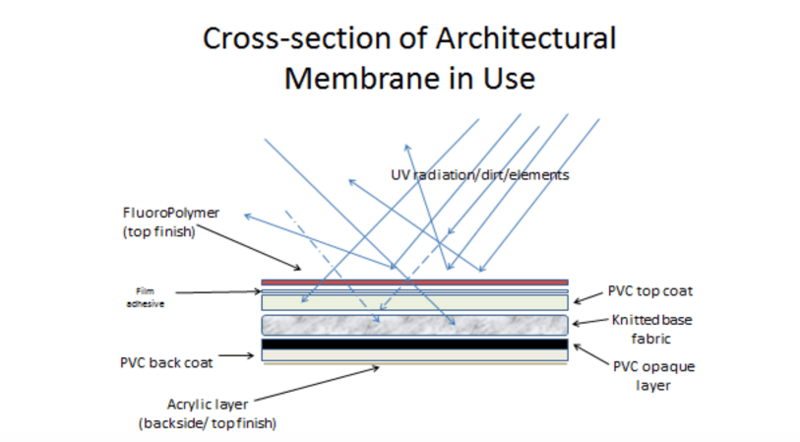 There are several items to consider, all of which contribute to the life of the coated fabric used in the building construction. Over time, UV wears on the coating. When the coating is gone, the fibers are exposed and the material fails due to strength loss. Some products have better, longer UV life than others (see diagram below). Like UV, other aspects of weathering such as wind, rain, snow, etc. are constantly attaching the exposed surface. The coated fabric used for the shell should be formulated to be as inert as possible to provide maximum life. An indoor sports facility will put different demands on the structure than a DOT salt storage facility. A sports facility will have lots of foot traffic and activity; a salt storage facility will have ingress/egress considerations, along with exposure to salt. The design of the facility, along with the shell material selection should consider the use. The shell fabric should be selected to handle the tear loading imposed by exterior forces (wind, etc.) and internal forces (air pressure for an air structure and tensile loading for a frame structure). Loads are often not linear and a tear can result. Internal tear strengths vary by material and are usually higher with a knitted base fabric over a woven base fabric. Excessive dirt pickup on a fabric structure is not always indicative of a deteriorating material, but is usually of concern and certainly worthy of further investigation. However, if the structure requires regular cleaning due to dirt pickup by the fabric, it can shorten the life of the material. PVF film top finishes have the lowest maintenance requirements because they are somewhat self-cleaning. Pick the fabric building material that meets your longevity requirements. Look deeper into how it will perform.